The term “Amish Furniture” brings to mind fine craftsmanship and heirloom quality, but not all Amish furniture is the same. At Herron’s, we have been forging relationships with our Amish builders for more than 20 years- choosing only the cream of the crop, the best of the best, to sell to our customers. The Hudson Hutch is a wonderful example of so many hutches available in a variety of styles and timeless designs to match any decor. Dove-tail jointed drawers and exquisite construction will show off your heirloom dishes or other adornments, beautifully protected behind glass doors. You customize the look with options including your choice of wood, finish and hardware. Each piece of furniture is exclusively built just for you using the highest quality materials to last for generations. The term “Amish Furniture” brings to mind fine craftsmanship and heirloom quality, but not all Amish furniture is the same. At Herron’s, we have been forging relationships with our Amish builders for more than 20 years- choosing only the cream of the crop, the best of the best, to sell to our customers. 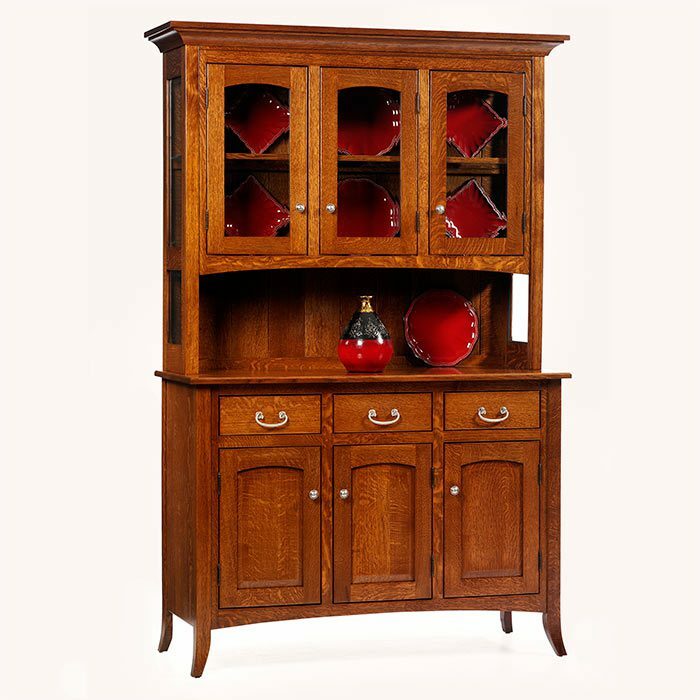 The Newport Shaker 2 Door Pantry is a wonderful example of so many hutches available in a variety of styles and timeless designs to match any decor. Dove-tail jointed drawers and exquisite construction will show off your heirloom dishes or other adornments, beautifully protected behind glass doors. You customize the look with options including your choice of wood, finish and hardware. Each piece of furniture is exclusively built just for you using the highest quality materials to last for generations. The term “Amish Furniture” brings to mind fine craftsmanship and heirloom quality, but not all Amish furniture is the same. At Herron’s, we have been forging relationships with our Amish builders for more than 20 years- choosing only the cream of the crop, the best of the best, to sell to our customers. The Artesa L Desk with Hutch is just one example of our well designed Amish built desks that are built to impress. From student to executive, corner to roll-top, with or without a topper; we are sure to meet your needs in functionality and style. Mix and match with other office necessities such as office chairs, file cabinets, credenzas, and bookcases to complete your home or business office. Choose your favorite wood and finish to make it uniquely your own. Need a special size to compliment your area? No problem, we can do that too! Solid wood and Amish craftsmanship make all of our office furniture the sturdy heirloom quality you expect from us at Herron’s. Not to mention the beauty that naturally comes with any of our hand crafted pieces. The term “Amish Furniture” brings to mind fine craftsmanship and heirloom quality, but not all Amish furniture is the same. At Herron’s, we have been forging relationships with our Amish builders for more than 20 years- choosing only the cream of the crop, the best of the best, to sell to our customers. The Keiran Hutch is a wonderful example of so many hutches available in a variety of styles and timeless designs to match any decor. Dove-tail jointed drawers and exquisite construction will show off your heirloom dishes or other adornments, beautifully protected behind glass doors. You customize the look with options including your choice of wood, finish and hardware. Each piece of furniture is exclusively built just for you using the highest quality materials to last for generations. The term “Amish Furniture” brings to mind fine craftsmanship and heirloom quality, but not all Amish furniture is the same. At Herron’s, we have been forging relationships with our Amish builders for more than 20 years- choosing only the cream of the crop, the best of the best, to sell to our customers. 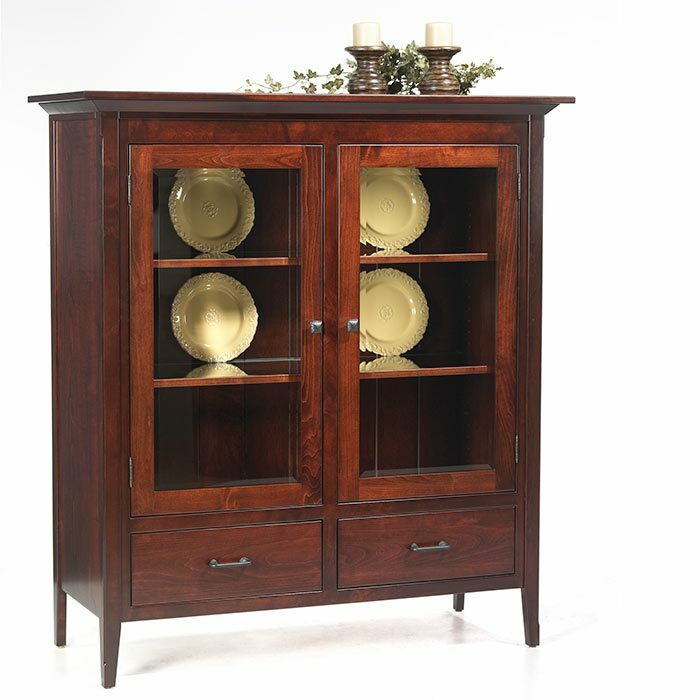 The English Shaker 3 Door Hutch is a wonderful example of so many hutches available in a variety of styles and timeless designs to match any decor. Dove-tail jointed drawers and exquisite construction will show off your heirloom dishes or other adornments, beautifully protected behind glass doors. You customize the look with options including your choice of wood, finish and hardware. Each piece of furniture is exclusively built just for you using the highest quality materials to last for generations. The term “Amish Furniture” brings to mind fine craftsmanship and heirloom quality, but not all Amish furniture is the same. At Herron’s, we have been forging relationships with our Amish builders for more than 20 years- choosing only the cream of the crop, the best of the best, to sell to our customers. The English Shaker Pottery Pantry is a wonderful example of so many hutches available in a variety of styles and timeless designs to match any decor. Dove-tail jointed drawers and exquisite construction will show off your heirloom dishes or other adornments, beautifully protected behind glass doors. You customize the look with options including your choice of wood, finish and hardware. Each piece of furniture is exclusively built just for you using the highest quality materials to last for generations.